Lemon desserts evoke thoughts of sunshine and are perfect for springtime and Easter. 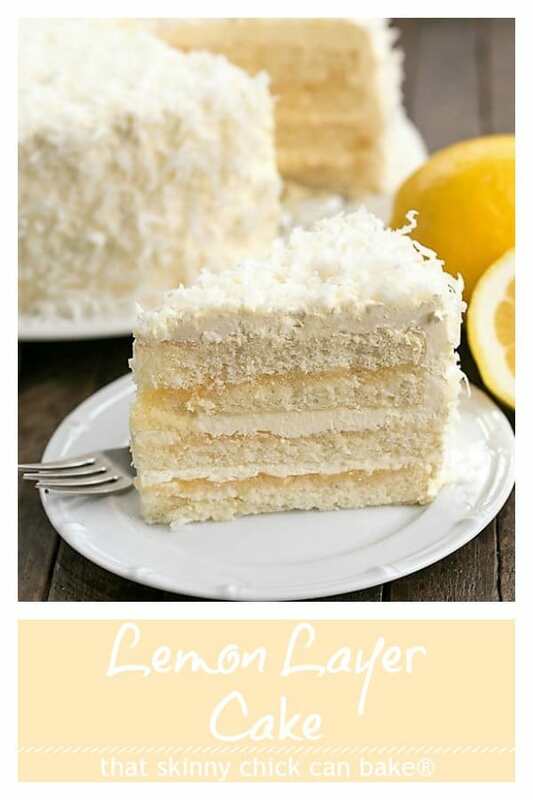 This luscious Lemon Layer Cake with Lemon Curd Filling is definitely a special occasion dessert! One of my dear friends was celebrating a monumental birthday, so we planned a luncheon for her special day. I volunteered to bake the party cake, of course. I knew she adored lemon and I sent her a text to double check if coconut was a yea or nay. 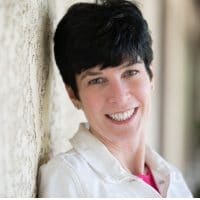 Susan confirmed her affinity for coconut and that sealed the deal. I planned to make a multi-layered show stopper, with a lemon kissed cake, lemon Swiss meringue buttercream and lemon curd! This cake with lemon curd is an adaptation of Dorie Greenspan’s Perfect Party Cake. I upped the lemon ante by swapping lemon curd for the raspberry preserves Dorie tucked between her layers. 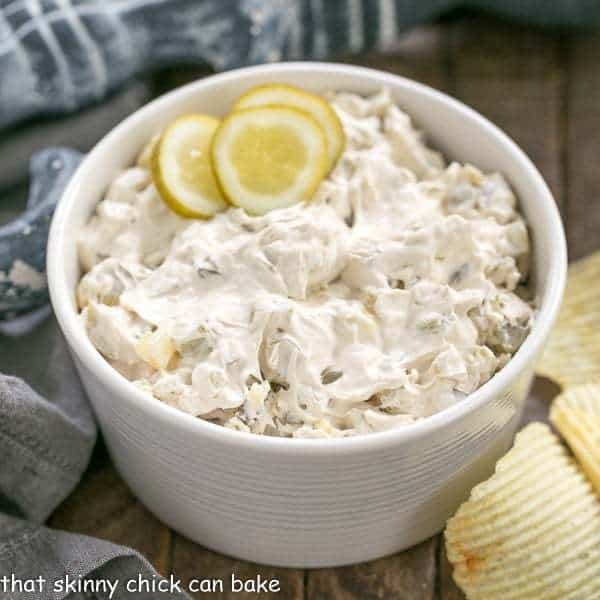 This is one of those recipes you might want to make in steps. If you haven’t sliced cake layers in half horizontally, it’s a little daunting. My PRO-Tip is to place toothpicks around the perimeter of the cake, just below the mid-line, to give you some guidance as you make your cuts. I use a long serrated knife and work my way around the edge with shallow cuts before slicing my way through to the center. You want to aim for 4 slices of approximately the same thickness, so take your time to place your toothpicks and with slicing each cake. But this will still be a wonderful cake no matter how you slice it! Swiss meringue buttercream may appear difficult, but if you take the time and follow the instructions, you’ll understand why this velvety frosting is my very favorite and worth the effort! Besides the typical American buttercream frosting, there is also Swiss, French and Italian buttercream. If I’m not going with the usual butter and powdered sugar version that’s popular in the states, I make a Swiss Meringue Buttercream. There is much less sugar in a Swiss Meringue Buttercream, and all the European buttercreams use eggs. This meringue uses egg whites, but don’t worry, they are safe to eat. They are gently heated over simmering water for 3 minutes, long enough to kill any salmonella bacteria. Use your instant read thermometer, if desired, to make sure the mixture reaches 160º. The mixture of sugar and eggs must be whisked constantly during this process so they do not cook, but stay liquid. Next, you whip this mixture in your stand mixer until cooled, which will take 10 or more minutes, so be patient. Keep feeling the sides of the bowl as if it’s warm when you add the butter, your frosting will not whip properly. Add your butter one tablespoon at a time, using the paddle attachment, and don’t fret if it doesn’t look perfect. You will continue adding the butter then whip the mixture on high for 6-10 minutes until your frosting is fluffy! There was loads of praise from the party attendees, one of whom even said this cake with lemon curd was the best thing I’ve ever made. I had a captive audience as I explained my horizontal cutting technique to make the thinner layers and the process of making a velvety Swiss meringue buttercream, which by the way, spreads and cuts like a dream! 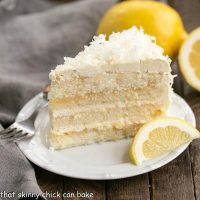 If you have a lemon lover in your life, save this best lemon cake recipe for a special occasion! Preheat the oven to 350 degrees. Grease two 9-inch cake pans with non-stick flour and oil baking spray (like Baker’s Joy) and line the bottom of each pan with parchment. Spray the top of the parchment as well. To make cake, first whisk together the flour, baking powder and salt. Whisk together the milk and egg whites in another bowl. Put the sugar and lemon zest in your mixer bowl and rub the zest into the sugar until the sugar becomes moist and fragrant. Add the butter and beat at medium speed until the butter and sugar are very light, about 3 minutes. 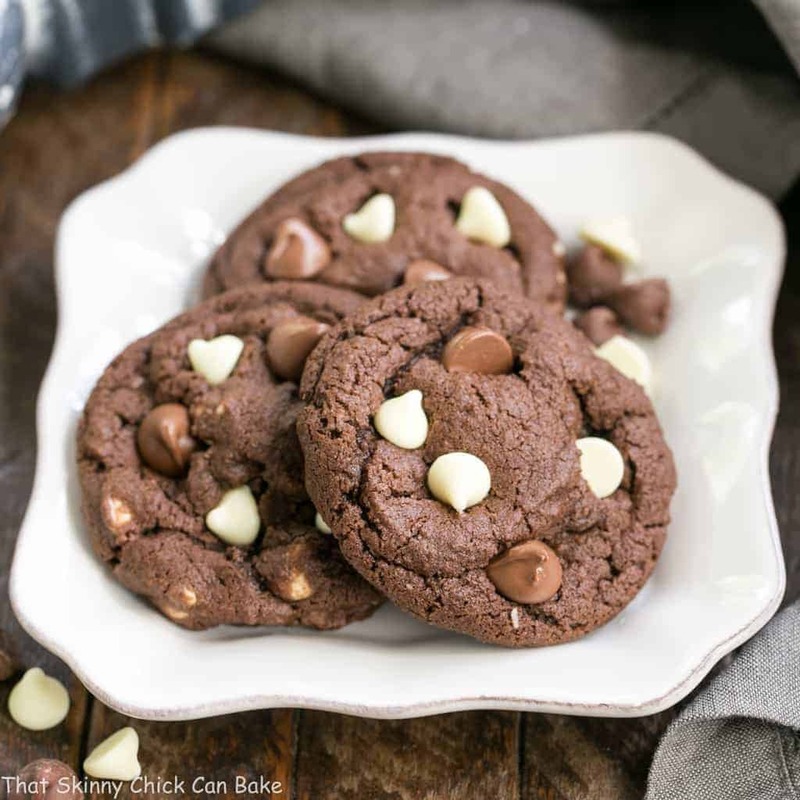 Mix in the extract, then add one third of the flour mixture and mix until combined, then half the milk-egg mixture until incorporated, another third of the flour mixture, the rest of the milk-egg mixture, and finally the last of the flour. Scrape the bowl as needed and make sure ingredients are incorporated as you alternate. Beat for another 2 minutes. Divide the batter between the two pans and smooth the tops with an offset spatula. Bake for 30-35 minutes or until the middle of the cake spring back after being touched. Remove the cakes to cooling racks. Let cool for 5 minutes before removing from the pans. Remove the parchment from the cakes, then let finish cooling top side up. To make the buttercream, place the sugar and egg whites in a heat safe mixer bowl over a pot of simmering water. Whisk the mixture continuously until it becomes hot to the touch and the sugar is dissolved, about 3 full minutes. Carefully remove the bowl from the heat and beat on high for about 5 minutes, or until the meringue has cooled (I recommend using a stand mixer if you have one). Using the paddle attachment mix in the butter a stick at a time, beating until smooth. Once all the butter is in, beat in the mixture on high speed until it is thick and very smooth, 6-10 minutes. Decrease the speed to medium and gradually beat in the lemon juice, waiting until each addition is absorbed before adding more. Mix in vanilla. Set aside while preparing the cakes. To assemble, slice each layer horizontally in half. I place toothpicks around the perimeter of the cake a little below where I want to slice. This helps guide my serrated knife as I saw through the layers. Place one layer, cut side up on your serving dish. Spread it with one third of the lemon curd, about ⅓ cup. Spread about ¼ of the buttercream over the lemon curd, repeat two more times, then top with the final layer of cake with the baked side up. Use the rest of the buttercream to frost the top and sides of the cake. Press the coconut over the frosted surfaces. That looks so dreamy and beautiful! A perfect layered cake for spring, Liz. I’m in love! I have a big birthday coming up, I think I will request this! This cake looks so amazing!! I’ve been working since last week to create a lemon cake with lemon curd but haven’t quite figured out exactly how I want it to be. I’ve since seen so many lemon cakes pop up, I guess it’s that time of the year. 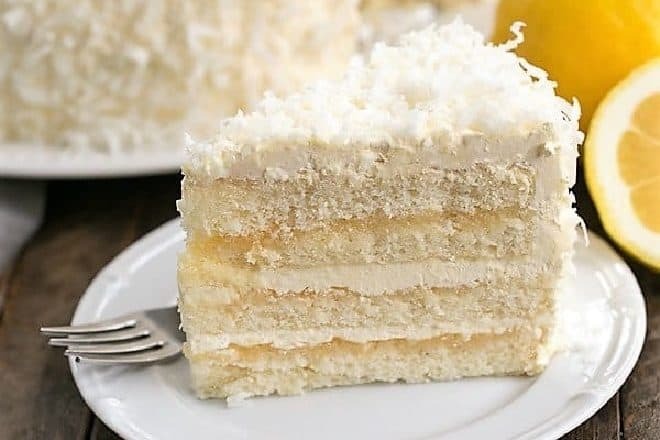 Your cake looks wonderful and I love that you paired it with coconut for an even more spectacular cake. Love this. I can’t wait until I actually figure out how I want mine to look. 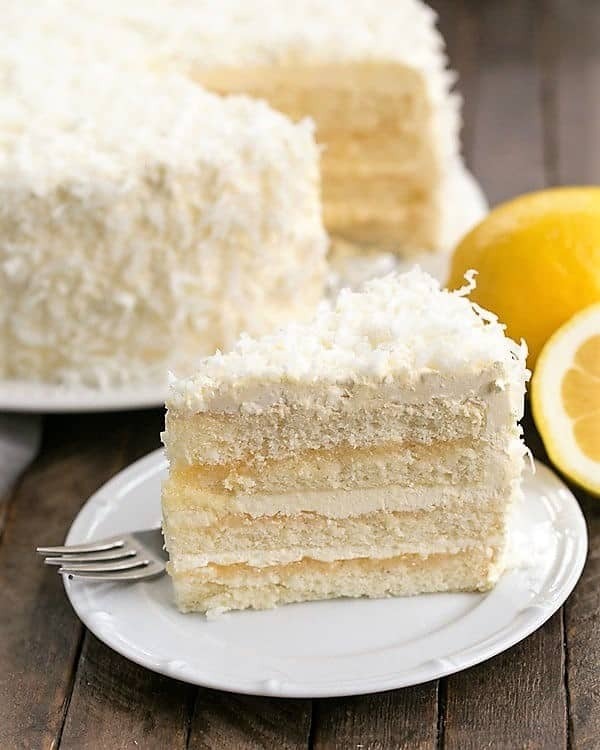 I love the combination of lemon and coconut. The perfect cake for a birthday. That is such a gorgeous celebration cake. 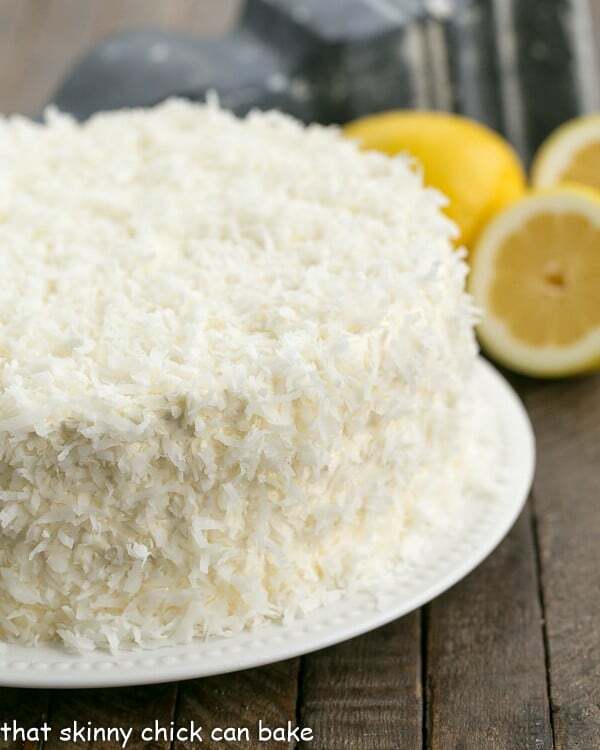 I love the lemon on lemon theme and then it’s kissed with buttercream and coconut. Wow. Just wow. Love lemon curd Lizzy ! look delicious !! She had a surgery, but nosw is better . Hugs! This is such a beautiful cake, Liz! I love lemon desserts this time of year! I love that you swapped out raspberry for lemon–GREAT cake! This is too pretty, Liz! 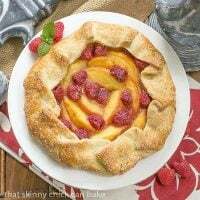 Love that lemon curd filling! What a luscious cake Liz! I wish I had a bite! Simply gorgeous! A beautiful slice of sunshine indeed. You’ve outdone yourself, Liz. Such a gorgeous cake! You always leave me impressed Liz! 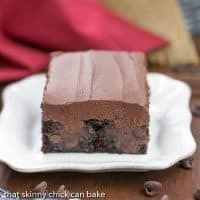 I absolutely love cakes with the layers in half – the cake to filling ratio is perfect. And i dont destroy as maby cake layers as I used to 🙂 The flavor in this sound amazing! This is a MUST MAKE for Easter! YUMMY!! This cake is a show stopper indeed and everyone in my family would love it! Yeah, the layers should be thick enough to cut, but I know you’re a great baker so not sure what went wrong! Just to restate the obvious, did you use a tablespoon of baking powder? It is a bit more than you’d find in a normal cake. And make sure your baking powder is fresh, which you know. Did you beat the batter for a full 2 minutes after everything was incorporated? That helps to aerate the batter properly. Let me know how your next attempt goes. I’m going to go over the recipe again to make sure there are no errors! The acid from lemon juice or buttermilk in the mix neutralizes baking powder and/or baking soda. The cake must be baked immediately after mixing. Batter waiting on the counter will most likely end up with a has-not-risen-properly cake. Yes, I always bake my cakes immediately! Great tip for those who might delay getting the batter in the oven. Thanks, DB. What a beautiful cake Liz, this one has me spell bound, love lemons and coconut and the crumb looks perfect. This looks amazing but I’d make my own lemon curd. No point in going through all this work and using inferior Lemon curd. 😉 yum. Oh, yes!! It would be even better with homemade lemon curd!!! This cake looks beautiful. Mine is in the oven now. There was hardly enough batter to go completely across the pan; truly this should be baked in 8 inch pans. I am hopeful that it will rise enough that I can cut the layers, otherwise the double batch of home-made lemon curd I made will be a waste. Had I not taken the time to prep two 9″ pans I would have dumped the better into my 8″ pans instead. This is for my son’s birthday tomorrow, I hope it turns out as it’s Christmas and I will not be able to get another cake! I’ll let you know! I made mine in 9-inch pans, and had plenty of batter, so fingers crossed yours will be fine! Confession. I might be a wee bit addicted to lemon curd. That is the BEST cake for spring! My mother would LOVE this cake. Two of her very favorite things: lemon & coconut! Can you substitute lemon juice for lemon extract in this recipe? Hi, Holly, I don’t think 1/2 teaspoon of lemon juice would add much flavor, so I’d just leave it out. The zest should provide enough lemon flavor. You can always substitute vanilla extract, but that’s not necessary. Hope you enjoy this cake! I made this today! The buttercream is such a beautiful flavor – lightly touched with lemon – yum! I used Vanilla Bean Paste in place of extract so it had a million little seeds through it. And toasted the coconut flakes (and mixed in dedicated coconut) to give it a nice texture. My husband’s birthday is tomorrow- so looking forward to trying it!! I love your tweaks, Tara. Enjoy! lemon and coconut a win win winner ! love it! 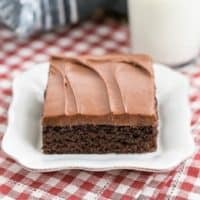 I made this cake and it was delicious – light and fluffy with a texture similar to angel food. I now want to use your cake recipe for my sister’s bottom tier of her wedding cake, which is 14″. Do you think it would dry out at this size? Also, how long do you think I should bake it for, and how many times would I need to make the batter to make a nice size cake, about 4.5″ tall or a bit higher? As it will be stored in the fridge in advance, do you think I should use a lemon glaze to keep it moist, or will the curd do that on its own? Thanks for your help. I’m so glad you enjoyed this cake. I wish I had a definitive answer for you but I’ve only made this cake as written. 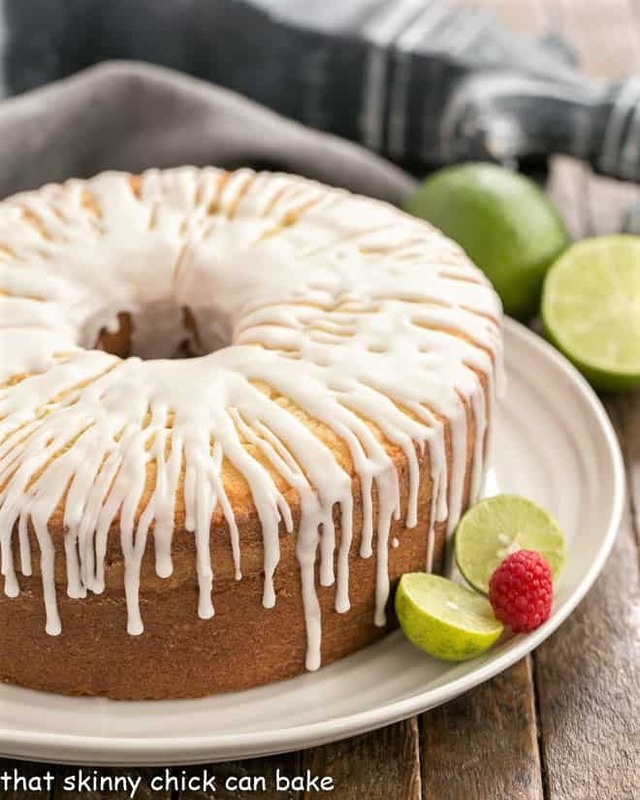 I did a brief search to see if I could find some info for you, and there were a few tips here: https://www.leaf.tv/articles/how-to-bake-oversized-cakes/ I’m thinking the lemon curd will keep it moist enough and it should be fine as long as its not over baked. But a lemon glaze certainly wouldn’t hurt! What are you stacking on top? I’m worried that since this is a lighter textured cake, it won’t hold up to too many toppers. Fingers crossed for you!! Question, will the cake layer freeze well? I have a busy schedule and wanting to make the layers a couple of days ahead. This recipes looks amazing! Karen, I haven’t frozen the layers, but generally there isn’t a problem. Just wrap them well and defrost in the fridge. Good luck!! This cake was everything a cake should be. Perfection. I’m so glad you enjoyed!!! Thanks for taking the time to let me know. Happy holidays!! Hello, I wanted to make this cake for my daughter’s first birthday. We are having around 30 guests- any ideas how I can change the proportions of the ingredients to suit 30? Thanks! I was going to use 10 inch round trays. Just finished making the cake. Can I refrigerate it and do frosting/layers and assemble tomorrow? Hi, Deb, Yes, that should be fine. When the cake is cool, I’d wrap the layers in plastic wrap and refrigerate. Hope you enjoy!!! This looks amazing, but I can’t uae buttermilk in the cake due to a dairy intolerance. 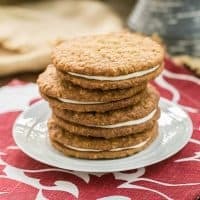 Do you think coconut milk or almond milk would do the trick, or is the buttermilk a vital part of the recipe? Since buttermilk has a bit of acid, I’m afraid that the food chemistry might be out of whack without it. I’d tell you to experiment if it was a simple cake, but I’d hate for it to fail since it’s a more complicated recipe. Wish I could be of more help!